Celery is a widely cultivated, biennial plant; the fleshy, bulbous root sends up, in the second year, an angular, furrowed, branched stem from 1-3 feet high. Celery leaves are opposite, dark green, shiny, and pinnate, the leaflets wedge-shaped, incised, coarsely toothed. The white to gray-white flowers bloom in paniculate compound umbels from July to November. The fruit is a small, ribbed, elliptic-ovate seed. Other varieties: Leaf, French or Chinese celery (A. graveolens var. secalinum) or (A graveolens var. par-cel) native to Europe and Asia. Cultivated and also grows wild in salty soils of North and South America, Europe, and Africa. In the older civilized parts it was cultivated prior to the Christian era. Now it is cultivated in the British Isles, India and the United States and Canada. Wild celery (A. graveolens) Native American names: Shoshone, “Hobe”; Paiute, “Yeduts”; Washoe, “Mo-zook-addas”; in Warm Springs, Oregon, “P’tish-p’tish” dried and used for perfume. Celery neutraizes uric acids and other excess acids in the body. Usually the seeds (2 heaping tbsp. in 2 quarts water) are made into a tea. This tea, in a covered pot, is allowed to simmer slowly for 3 hours, strained, and taken hot, 1 cup 3 to 4 times per day. Reduces blood pressure. Relieves muscle spasms. Good for arthritis and liver problems. Acts as an antioxidant and as a sedative. Celery juice and oil induces menstruation. The expressed juice of the plant, particularly the fleshy petioles, is the most effective form of medicine. It can be used for dropsy, rheumatic tendencies, gout, lumgabo, tendencies toward overweight, flatulence, neuralgia, blood tonic, produces perspiration, nervousness, chronic pulmonary catarrh, lack of appetite, indigestion, and deficiency diseases. It is a strong diuretic which is not to be used when acute kidney problems exist (moderate use is allowable when kidney problems are chronic). Promotes the onset of menstruation; take it only in moderate amounts during pregnancy. As a salad vegetable or made into a tea, celery can be helpful clearing up skin problems. A decoction of the seeds can be used for bronchitis and as a sedative for nervousness. A yellowish oil extracted from the root can restore sexual potency impaired by illness and frigidity, kidney and bladder problems. Celery juice is distinctly alkaline and eliminative. It is therefore recommended for all disturbances caused by the accumulation of wastes and toxins, such as rheumatic and arthritic ailments. 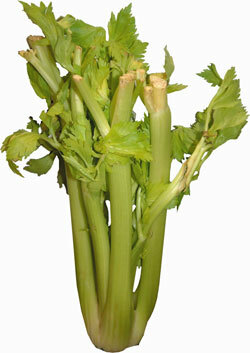 Celery juice regulates the water balance and puts new life into elderly people. Decoction: use 1/2 tsp. seeds with 1/2 cup water; boil briefly and strain. Juice: take 1 tbsp., 2 to 3 times a day, an hour before meals. An electric vegetable juicer makes fresh celery juice easy to extract. Mixes well with carrot and apple juice. Due to its high sodium content, use less than you do of the carrot and apples, if blood pressure is high. Oil: take 6-8 drops in water, 2 times a day. This vegetable or the seeds can be purchased in almost any supermarket. Bergaptene in the seeds could increase photosensitivity, so do not apply the essential oil in the bright sunshine. Avoid the oil and large doses of the seeds during pregnancy: they can act as a uterine stimulant. Do not buy seeds intended for cultivation, they are often treated with fungicides. Celery juice and celery oil should not be used during pregnancy. PubMed.gov: Chemical synthesis of 9(Z)-octadecenamide and its hypolipidemic effect: a bioactive agent found in the essential oil of mountain celery seeds. PubMed.gov: L-3-n-butylphthalide improves cognitive impairment and reduces amyloid-beta in a transgenic model of Alzheimer’s disease. PubMed.gov: Gastric antiulcer, antisecretory and cytoprotective properties of celery (Apium graveolens) in rats. PubMed.gov: A toxicological investigation of a celery seed extract having anti-inflammatory activity.